Vguevara21. Alvar Nunez Cabeza De Vaca. Digital image. 11, December 2014. Web. 12/7/15. 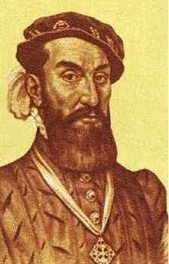 Born anywhere between 1488-1492, Cabeza De vaca was an explorer of Spanish descent. More notably one of the four survivors of the “Narvaez expedition.” While traveling across what is now the southwestern portion of the United States for eight years, he became a trader and healer to various Native American tribes before relocating back to Mexico so that he could join Spanish colonial forces in the area. Returning to his native country in 1537, De Vaca wrote an account that was officially published in 1542 about his Anthropological observations while interacting with indigenous tribes. In 1540, De Vaca was appointed as “adelantado”, which is similar to being a governor, or elected official to oversee a particular region or area. He served as Adelantado of the Rio De La Plata, which fell under a portion of Argentina’s boundaries. While in Argentina, De Vaca spent a great deal of time increasing the population in Buenos Aires. This is because due to the poorly orchestrated administration at the time, population dwindled. Condequently, De Vaca would be transported to Spain to be put on trial in 1545, though he never received a sentence. He ended up passing away in Seville between 1557-1560. As an observer of Native American practices and behaviors, De Vaca spent many years with various peoples including the Capoque, Han, Avavare, and Arbadao. Most of which he recorded included details about the inhabitants treatment of offspring, their marriage practices, and their sources of food. Relating to the texts in class, Cabeza De Vaca departed Spain For the Americas around 1527. In April of 1528, he landed near what is now Tampa Bay with a league of soldiers. Exhausted and distressed by lack of food, De Vaca’s expedition went north, and then west along the southern coast of Florida near the Gulf Of Mexico. While there, De Vaca pressed forth, heading towards Alabama, Mississippi, Louisiana, and Texas. In the process, three boats were lost, including a good portion of the men. Cabaza and a few of him men were a few of the remaining survivors after those that did end up surviving the ship wreckage were wiped out by hunger and attacks. They named where they landed “The Island Of Misfortune”, real location somewhere in the proximity of Texas. From 1529 to 1534, De Vaca and his accomplices lived in semi-slavery, where they cooperated with the natives of the region, and as a result, De Vaca improved upon his skills as a medical man. Branching off into east Texas, De Vaca hoped to reach Mexico and find some Spanish settlers along the way. Crossing the Pecos and Colorado River, with the assistance of some Native Americans, De Vaca made in to Mexico and was located by another Spanish party. He returned to Spain in 1537 with notes on his findings. Wikipedia. Wikimedia Foundation, n.d. Web. 08 Dec. 2015. <https://en.wikipedia.org/wiki/%C3%81lvar_N%C3%BA%C3%B1ez_Cabeza_de_Vaca>. The Open Anthology of Earlier American Literature: A PSU-Based Project by Sam Gagnon is licensed under a Creative Commons Attribution 4.0 International License, except where otherwise noted.